The newly established telegraphy course at the Ballarat School of Mines Ballarat commenced at the beginning of 1874 under the lectureship of William P. Béchervaise. Examinations were conducted in March and September of each year. The first intake of students numbered 46 women. At the end of 1874, the course examiners, Robert L.J. Ellery and Samuel Walker McGowan awarded seven Competency Certificates, to Marianne [Mary] Drury; Annie Winnifred Eastwood; Mary Frances Farrer; Jemima Lynn; and the Gatliff sisters: Annie Louisa, Eliza Beaumont and Mary. In 1875 Ellery and McGowan awarded a total of 28 Competency Certificates to 16 women and 12 men. The retirement of SMB's long-standing examiner and patron, Samuel McGowan in 1886 was followed by his death in 1887. 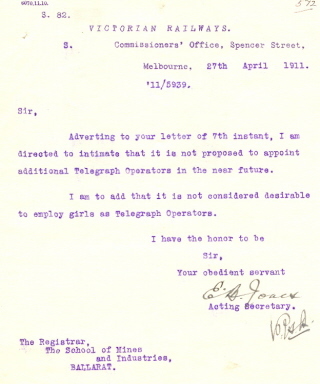 This, and the onset of the 1890s Depression, led to a decline in enrolments the telegraphy course conducted at SMB. This situation was also compounded when the colonial Telegraphy Department declared that the rate at which students were required to send words was to be raised from 10 to 20 words per minute in 1890. Enrolments declined immediately, with only three female and four male students receiving Competency Certificates at the end of 1891. In the School's 1894 Annual Report telegraphy lecturer J.A. Dawson wrote 'Electricity Applied to Telegraphy - Only a limited number have attended this class during the year, as the chances of appointments in the Telegraph Department are very remote.' The telegraphy course at SMB ceased at the end of 1894 however, in 1909 it was re-established under the lectureship of Thomas Arthur Williams [see individual entry]who remained with the School under 1917. The telegraph was the most dominant of the communication inventions of the nineteenth century. Its dramatic arrival in Britain, Europe and North America by the early 1840s - a decade before it was introduced into Australia - marked the emergence of communication as a phenomenon differentiated from transportation. Between the 1840s and 1920s the most significant international communication medium was the electric telegraph: the form of technology whereby coded messages could be sent over great distances, using electrical signals transmitted along wires. From the outset, the colonial governments in Australia established their telegraph systems as private enterprises, constructed and maintained by officers employed in government-run telegraph departments. The first electric telegraph was sent from Melbourne to Ballarat by The Hon. John B. Humffray on 3 December 1856, and the Victorian-South Australian line was opened for business in late July 1858. At Ballarat, the booming inland gold town with a telegraph station on the new intercolonial connection, the local editor hailed the opening of the line as marking both an achievement and a promise for the future of Australia as a whole. This electromagnetic relay device was used in telegraphy. Its working parts are mounted on a brass plate attached to a wooden base. It is equipped with four terminal posts and has an adjustable contactor mechanism. The instrument is believed to have been acquired for use in SMB's telegraphy course conducted 1874-1893. Image caption (LHS): Page from the SMB Minute book relating to separation of make and female students in Telegraphy classes.